Epson's fully integrated, multifunction TM-S9000 scanner and printer offers more functionality than any device in its class. It features the industry's fastest check scanning speed, the highest MICR accuracy in its class, an award-winning TM-T88V receipt printer, cashier check and endorsement printing, 2-sided ID scanner and more. 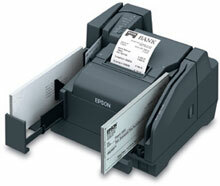 The Epson A41A267131 is also known as Epson POS Products	EPS-A41A267131	.